This wall rug is very beautiful and well-made and goes great in my dining room under my dining room table. I would recommend a threat to anybody who has a contemporary decor! I was concerned about some of the reviews commenting about excessive shedding. I don't believe that this rug sheds anymore than most wool rugs. Colors are beautiful. My hope was that the rug would have the 'luminescent' quality it seems to have (the cream colors) in the photo - and it does. It is one of my favorite purchases ever. I couldn't be more pleased! I ordered one rug about four years ago and have since added three more! Stain resistant and gorgeous! They are the first thing anyone notices when entering my home and ALWAYS compliments.The shedding that you read about is temporary. I would buy again and am ordering another today!!!!! If you want to make something pop in your room, add this rug to it. So many different colors. It matches just about everything. you can do neutrals, blues, greens, oranges, yellows, blacks browns and on and on. Love this rug. Well made. Looks like you spent a fortune on it. Cleans easily with damp cloth. Do vacuum when you first get it. It does release some fibers until you vacuum it. Still as thick and beautiful as when I got it 5 years ago. It's in a high traffic area and is still holding up. You get your moneys worth with this rug. I ordered this with a round one to put in my living room. Love these rugs. Easy to clean. love the swirls and multi colors. I can use them any where in my house. I have the much larger rug in this design and this is perfect for a walk through area to go with the large rug I have in an adjoining room. Would have been nice to get the pad at the same time I got the rug. Beautiful, soft rug. Brings great color and vitality ro the entry way. The only downside is that it is 100% wool which tends to shed quite a bit so requires more vacuuming than other rugs. However, it is worth the effort. the rug is pretty but it sheds to much. This rug is beautiful and a gets compliments from all my quests. I wish I had purchased more. This rug is a show stopper! I get so many compliments on it and it is wearing very well. It shed for about the first month from traffic and vacuum cleaning, not bad at all, and has stopped completely now. Very plush with great color for my darkish entry. Providing comfort for all four seasons and after a few years, still looking good. 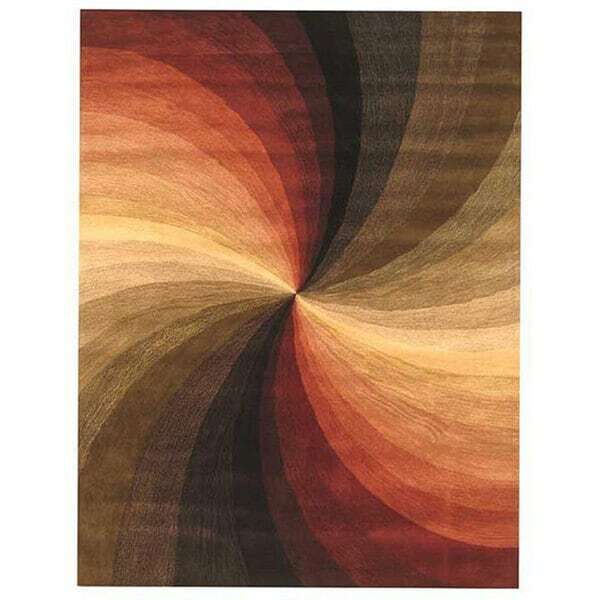 This abstract swirl rug is absolutely beautiful. This is the second one I have ordered. I have had a larger one in my living room for over a year and have received many compliments on it. I am putting this smaller one in another room. Love it. It will look beautiful with my new furniture.The colors are perfect for the my color scheme.Its nice and thick. "Can this rug be cleaned with a regular shampoo carpet cleaner?"